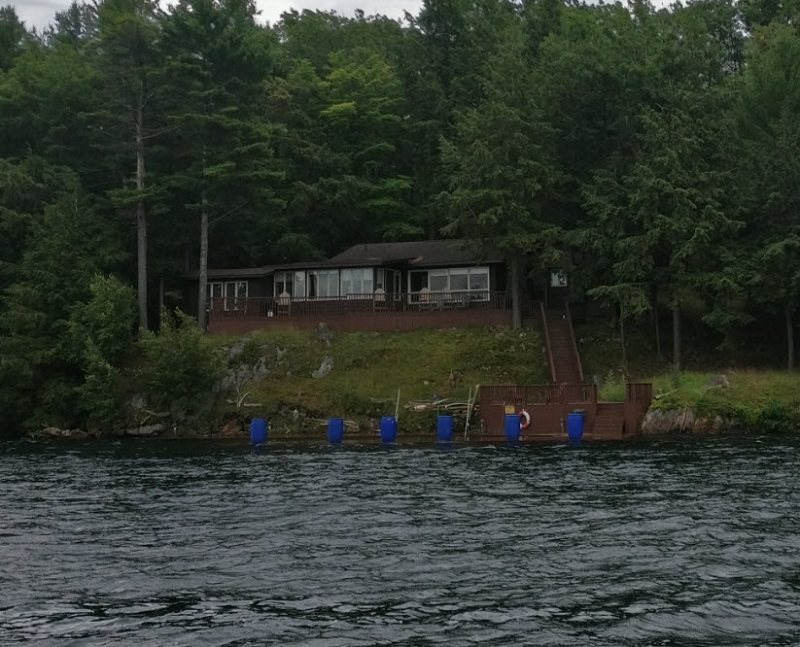 The 1000 Islands are located in the picturesque St. Lawrence River about 3 hours from Toronto or Montreal separating Canada and the United States along the border starting from the northeast end of Lake Ontario. The river and islands are a boater’s paradise where boat enthusiasts can rent a houseboat, sail or motor and meander through the river and channels exploring the fantastic scenery and many park islands managed by Parks Canada. Not only is the region for boaters as you will find beautiful cottages and homes scattered throughout the region on the many islands. The cottages range from the very basic and a small dock to palatial mansions with elaborate docks and boat houses. The weather in across Canada and the Northern United States in 2017 has been cool and very wet. The spring brought excessive amounts of rainfall that never seemed to stop long enough for the ground to recover. This excessive rain impacted rivers and lakes resulted in extremely high water levels throughout all the lakes and river systems throughout Ontario, Quebec and the north eastern United States. Unfortunately these high waters have had a huge effect on the islands and cottages. 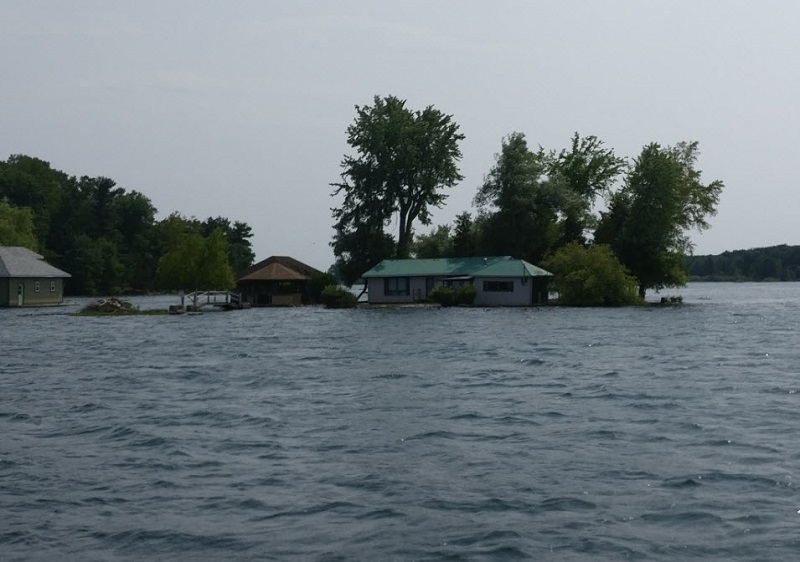 In the 1000 Islands many cottages have been damaged, some severely and docks destroyed preventing many people who own these beautiful properties accessing their islands and cottages. As much as the area is a boaters paradise it is a cottagers nightmare as boats and ships of all sizes pass through the area creating huge wakes in areas already flooded. 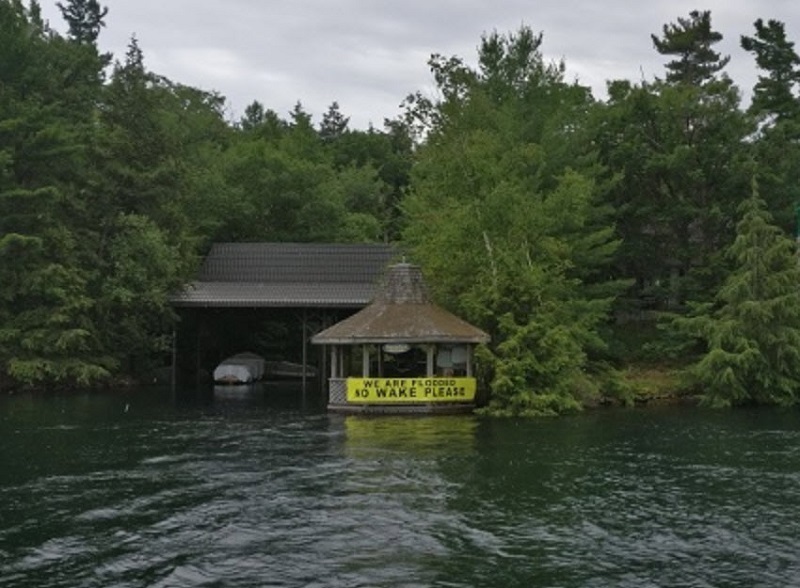 In desperation many cottagers have placed banners on their docks and boat houses pleading for boaters to go slow and not create a wake. 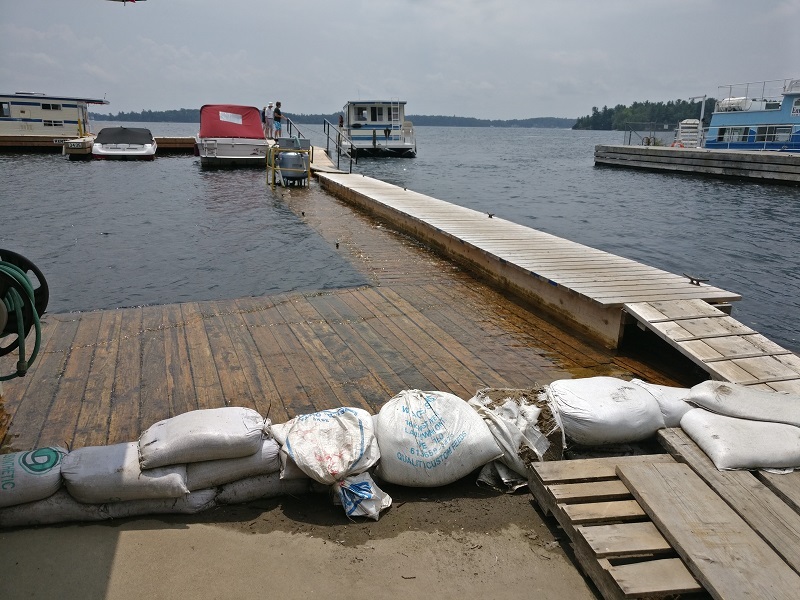 If the docks have not been destroyed many are submerged with heavy weights or barrel placed on them to keep them secured down to prevent further damage from the high waters. The cost to repair the damage created by the high waters and flooding is too early to be known. Until the water levels subsides allowing people access to their cottages and properties the damage cannot be determined or costs estimated. Although one would think that once the water returns to normal levels the docks will again be above the water surface however these docks will also need to be inspected for damage. Parks Canada owns and operates almost 20 islands in the 1000 Islands. Most of these islands provide docks for boaters, hiking trails and camping. Unfortunately over half of the docks at the Parks Canada islands had been closed and are gradually being reopened. Some islands were completely closed with no access permitted. Sadly some of the docks on the islands have been destroyed or badly damaged and will need to be rebuilt. Again the extent of the damage cannot be determined until the water levels drop. Rebuilding these docks will not be quick or easy and will unlikely be available 2017 and much into 2018. The reduced availability of docks at the Parks Canada islands has made it difficult and crowded for vacationing boaters. 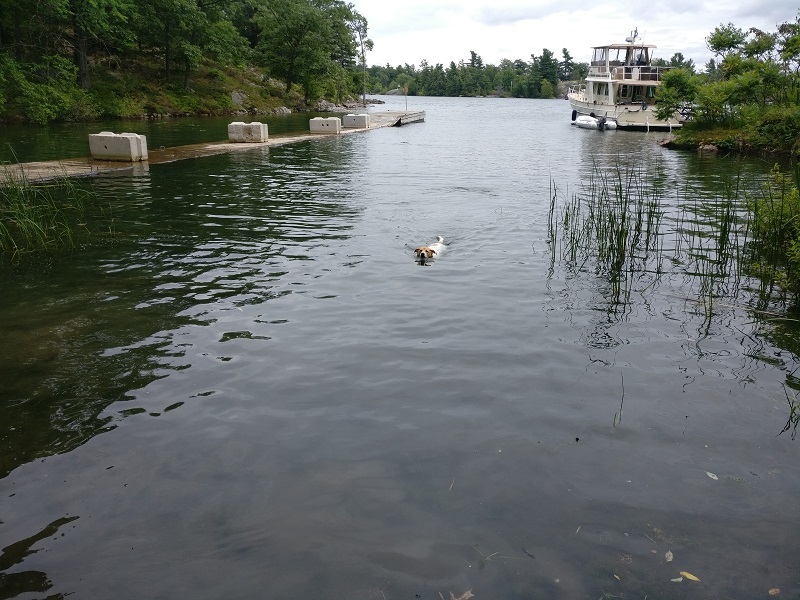 The 1000 Islands remains a key location for boaters from Eastern Ontario and Quebec and although the weather has improved boaters will unfortunately be surprised at the reduced number of places to dock for the evening. Camelot Island is a favourite island for many. As of July 21st, 2017 the island is open to use the trails, campsites, toilets etc. 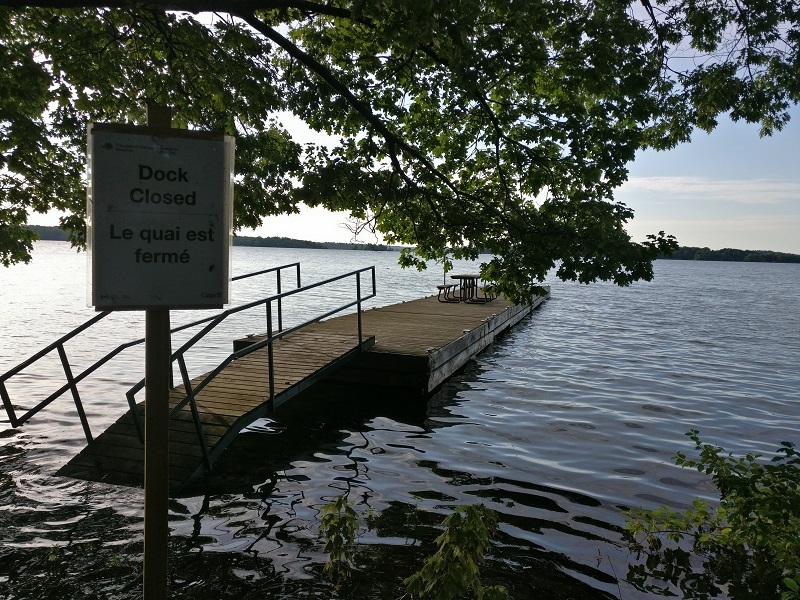 however all docks are closed with the exception of the blue line dock for kayaks and canoes and the yellow line dock for Parks Canada personnel. All other docks are closed as being submerged or damaged. A frequent and all too often occurrence observed throughout the island such as at Gordon Island. Aubrey Island located to the western end of the 1000 Islands near Gananoque is a beautiful island and popular for sailboats. 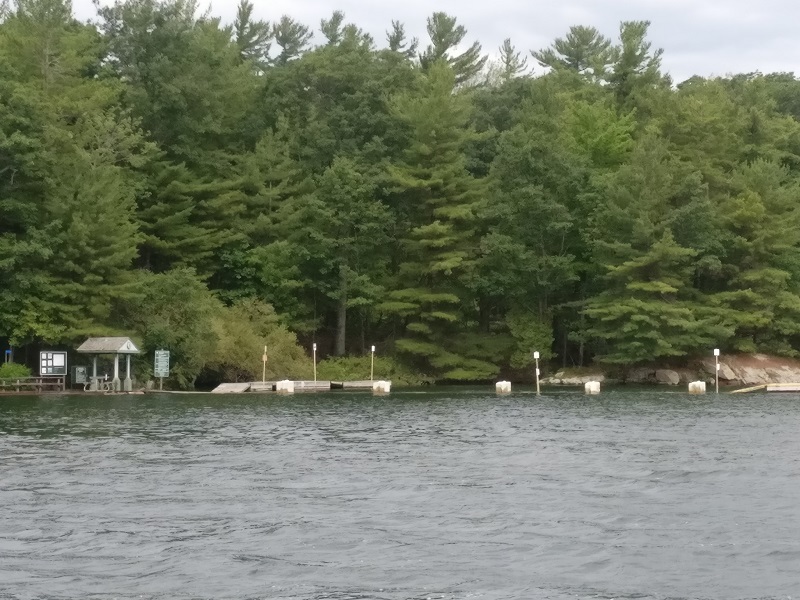 The island is open and many docks available however a main dock in a tranquil cove is submerged with weights to keep them from floating and causing more damage. The 1000 islands is also known for its history. On the US side of the river in the state of New York located on Heart Island is Boldt Castle. Back in 1900 George Boldt started to build the castle as a gift to his wife however his wife died in 1904 and work stopped and was never completed. Eventually, in 1977, the Thousand Islands Bridge Authority purchased the property and restored the buildings which is now open to the public and accessible by ferries, tour boats and private boats. 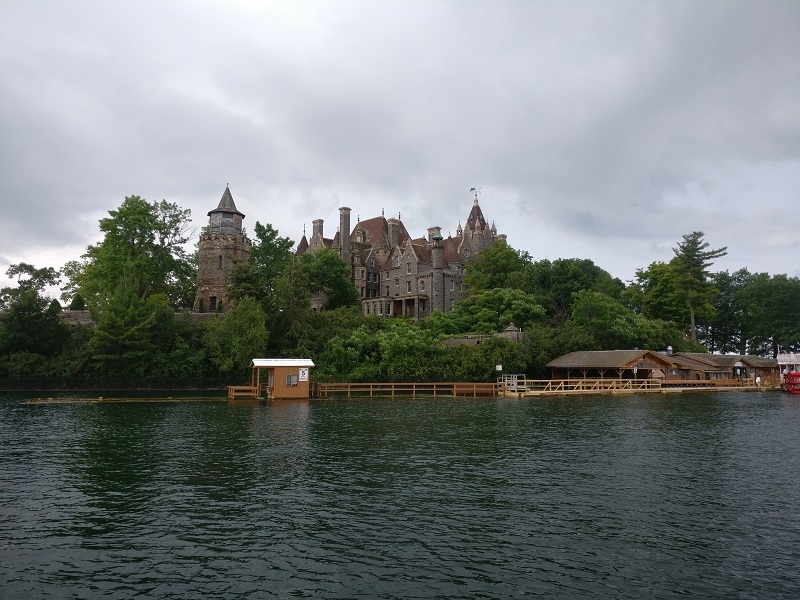 Unfortunately the high waters on 2017 have taken their toll on the docks and property of Boldt Castle. As of early July the docks were totally submerged making access to the island impossible resulting in the castle being closed to visitors until the first week of July. The docks are still submerged however a second layer of docks have been built on top of the original as a short term solution to allow visitors to disembark safely. Around the beautiful grounds of the island there was still a lot flooding that will require a great deal of repair and maintenance. One of the few places to get fuel, particularly for houseboats is the Andress Boat Works in Rockport, Ontario. They too have had to deal with the high waters. 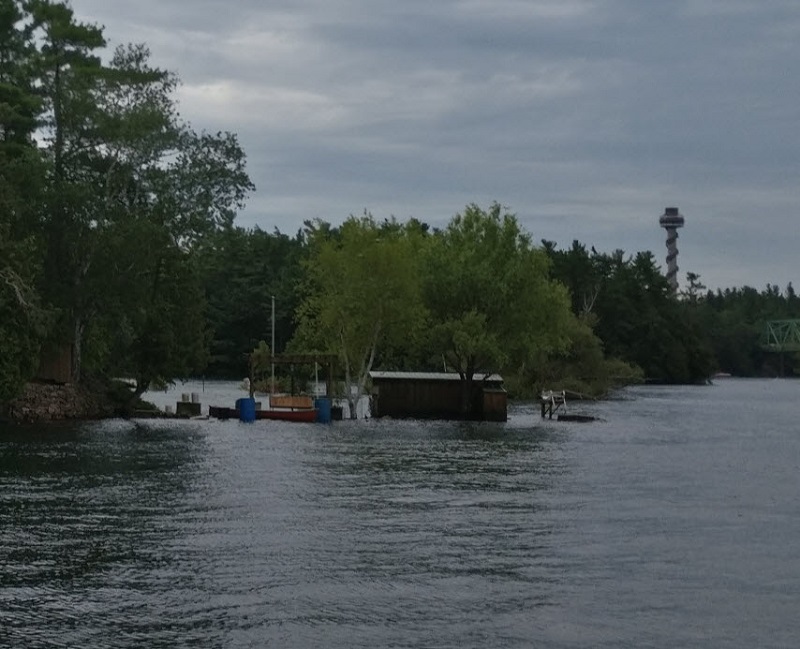 The original dock is submerged and a temporary second dock has been placed on top similar to Boldt Castle. Water had crept into their building and caused damage however fortunately they were able to minimize damage and losses by quickly raising merchandise and counters above the water levels. It has been a tough and difficult year for those around the waterways in Ontario, Quebec and north eastern Unite States. A great deal of damage has been done due to the increased water levels and flooding. It is very unfortunate that these areas of retreat will required extensive work and repair to bring their homes and cottages to the point they were previously. Tourism is also difficult as many, in particular boaters, have reduced access to many places to dock and spend their evenings. Houseboat Holidays who rents houseboats in the 1000 Islands are still having a great season albeit their facilities have also suffered damage. Nonetheless they are still operating with no cancellations due to the water level conditions. Let’s hope the water levels get back to normal levels and soon and everyone can once again enjoy this magnificent area!